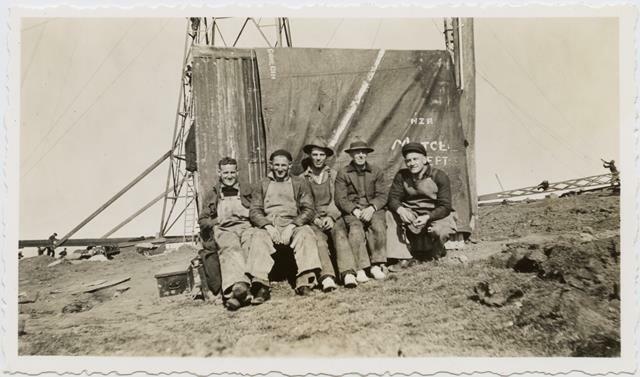 Blog post prepared by Assistant Curator (Photographs), Dr Anna Petersen. 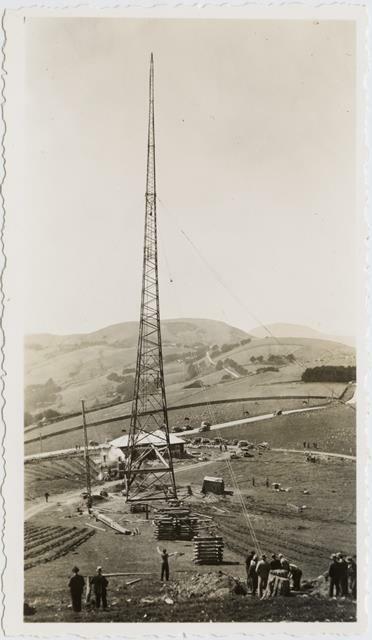 With all the talk about Dunedin winning the fast broadband competition to become New Zealand’s first gigatown, my unplugged brain had to search back to remember how ‘wireless’ used to be what people called the radio. 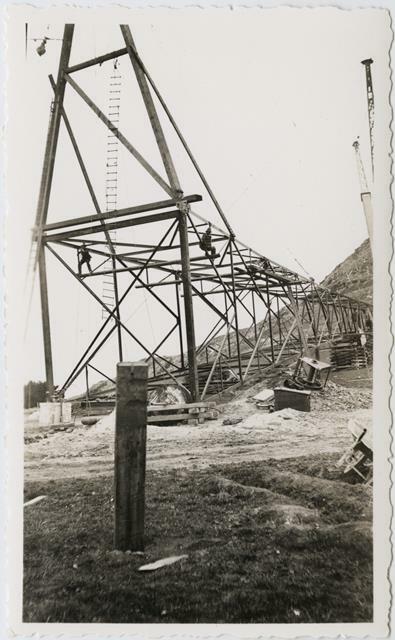 Almost 80 years ago now, the city got its first wireless mast and a recent donation of photographs (ref.code P2015-004/1) documents its instalment by Hillside Workshops staff on the hill at Highcliff in 1936. 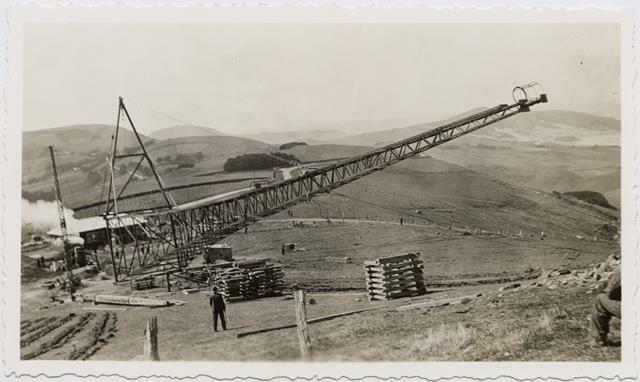 The following sequence of photographs shows the setting up of the first wireless mast. Recently, whilst moving the posters collection from the upstairs pictorial collections stack to new cabinets downstairs, a fantastic assortment of old Hollywood film posters was rediscovered. There are just over 60 posters ranging in date from the 1931 Marx Brothers’ film “Monkey Business” to the 1954 film “Saskatchewan”. They were all donated to the Hocken Library in 1976 and had belonged to William Strong of Naseby. The Hocken Archives collection includes a collection of William Strong papers [MS-1078], and these incorporate another set of Hollywood film posters from the 1940s and 1950s. William Strong was a watchmaker and jeweller who took over the watchmakers shop in Naseby opened by his father Robert in 1868.William was involved in a variety of local organisations, including the Naseby Cinema whose audience was likely drawn in by these enticing and colourful posters. The Hocken Posters collection included a fairly limited range of New Zealand related film posters until last year when a concerted effort to improve our holdings was made. Many posters have been sourced via online auction sites. Coverage includes the 1947 film “Green Dolphin Street”, which features a destructive New Zealand earthquake, and the 1964 film “Runaway”, that starred Colin Broadley along with Barry Crump, Kiri Te Kanawa and Ray Columbus. We continue efforts to improve our holdings of New Zealand film posters and ephemera and make them available to researchers of the New Zealand film industry. Please ask at the downstairs reference desk or email Katherine.Milburn@otago.ac.nz if you have any inquiries relating to the posters and ephemera collection. What were children’s birthday parties like in 1890s New Zealand? A sweet little account of one from Gore, Southland, has turned up in one of Hocken’s latest acquisitions: further papers of the historian James Herries Beattie (1881-1972). 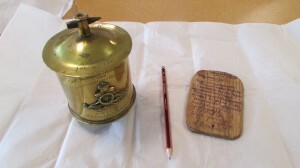 Among these papers is a notebook of verse and prose that Herries presented to his mother when he was eleven years old. 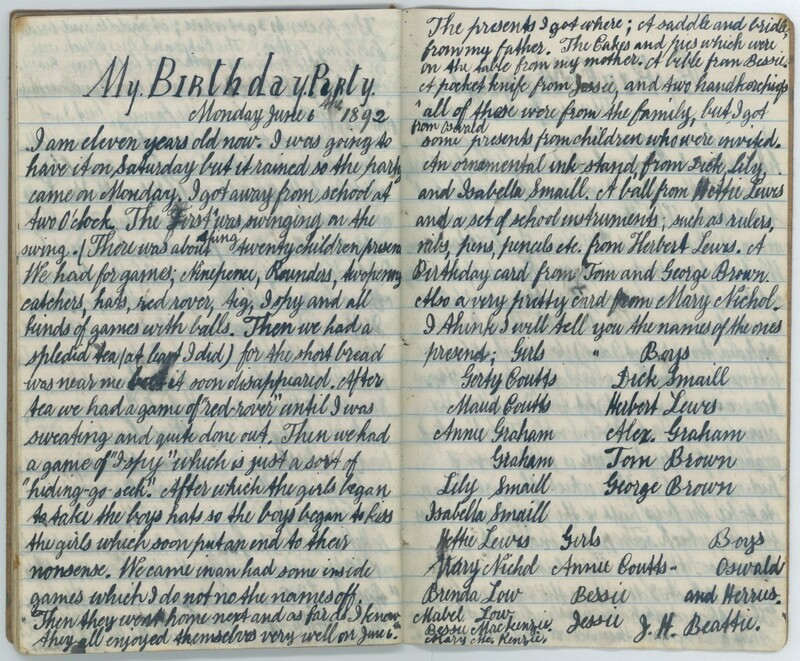 Herries wrote about his eleventh birthday, and tells of the games, the food, the gifts, and those who were there. The original version of the story is shown in the image below, together with a transcription of a ‘Revised Edition’ Herries made at the age of fourteen as part of an expanded series of four notebooks he titled ‘A Reading Book for spare moments’. The reason why there is more girls than boys is that my 2 sisters know more girls than I do boys. Beattie’s other childhood writings included verse, history, notes on New Zealand birds, short accounts of activities, and a longer story titled ‘The Boys of Kaikatoto School’. Other material recently acquired by Hocken dates from the 1940s to 1970s, and includes a ledger containing details of book publications and other accounts, reading notes, diary notes, and other papers. There is also the complete manuscript for an unpublished historical novel titled ‘Morry: A Son of the Backblocks’. These papers have been added to our existing collection of Beattie’s papers under the reference number MS-4237. 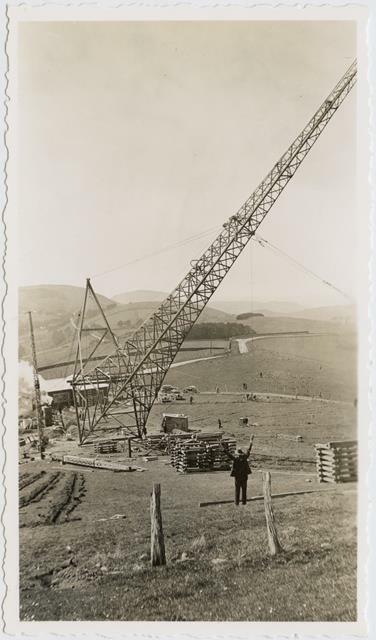 Llewellyn Beaumont was raised in Dunedin and served in both WW1 (in artillery units at Gallipoli and the Western Front in France) and WW2 (commanding coastal artillery at Taiaroa Heads). As a civilian Llewellyn worked in the wool industry, starting out as a wool classer and eventually working for David Reid and Co. as head of the wool department. 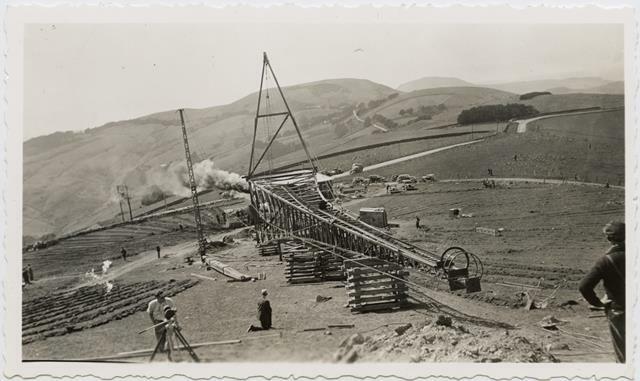 In 2002 Llewellyn’s son Matheson Beaumont donated several items relating to his father to the Hocken Collections. I recently had the pleasure of meeting with Matheson at a community day recently held at Otago Boys High School. The day was organised as part of the filming of a television documentary series called “Tony Robinson’s Tour of Duty” about the experiences of New Zealanders and Australians during war time. My role was simply to safely transport two items from the Hocken Collections and back again. 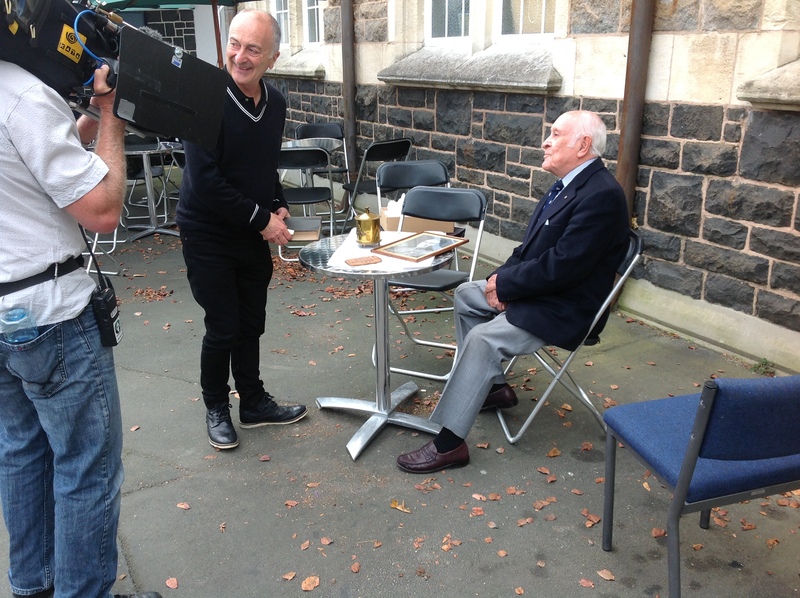 Tony Robinson interviewing Matheson Beaumont about Llewllyn Beaumont. At the community day Matheson was interviewed by NZ historian Damien Fenton, and by Tony Robinson himself about the items – a postcard written on a piece of wood from Gallipoli and a piece of “trench art” – a tobacco jar made from brass bullets and shell cases in France and dedicated to Llewellyn’s father, Captain Norman Beaumont back home in NZ. Tobacco jar and wooden “post card”. Hocken Collections Misc-MS-1787. Both items are evocative of the wartime – the postcard on wood sent from Gallipoli because they couldn’t get paper to write on. The tobacco jar is more decorative and includes bullets representing several nationalities, including German, and a NZ artillery badge. The postcard is addressed to Llewellyn’s sister, Con[stance] and has a positive tone although obviously he was making do with whatever he could find. Given that we know life for NZ soldiers at Gallipoli was hard perhaps he was being positive to save his family worry. Received news-papers but no letters lately. Paper appreciated very much. Receiving very little news of what is going on. Keeping in splendid health & enjoying life thoroughly. A glass lantern slide advertising a New Zealand Railways Mystery Tramp from Invercargill, c. 1930, 80mm x 80mm, Photographs Collection, Hocken Collections Uare Taoka o Hakena, University of Otago. This lantern slide promotes an excursion to an unknown southern destination for a mystery tramp, and was used for advertising to a cinema audience. Recently acquired for the Hocken’s Photographs collection, this New Zealand Railways promotion would have been projected onto the screen of an Invercargill movie house either prior or during a film showing. Introduced in the 1600’s the magic lantern was the earliest form of slide projector. With the aid of a concave mirror the lantern, illuminated at first by candlelight, projected light through a small sheet of glass known as a lantern slide. By the turn of the twentieth century lantern shows were a popular source of entertainment. They were also integral to commercial advertising in cinema. By the 1930’s many lantern slides were produced by a black and white photographic process and hand-coloured with transparent dyes. As well as being readily used in advertising, theatres also used magic lanterns to project ‘illustrated songs’, which were community sing-alongs with lyrics and illustrations, and to communicate short messages such as “Ladies, kindly remove your hats”, to their patrons. At first the burgeoning reputation of motion pictures did not impact on the popularity of lantern shows and they continued to be used for entertainment and educational purposes. However, after the introduction of 35mm Kodachrome colour transparency film in 1936 the use of the magic lantern for cinema advertising was quickly superseded by slide projectors as a result of cinemas being eager to embrace new technologies. The success of rail tourism during the interwar years, an era when private car ownership was on the rise, may be attributed to the advertising prowess of the Railways Department. Train travel and the popularity of day excursions was also boosted by the shorter working week which gave large sectors of the population more time to enjoy leisure activities. 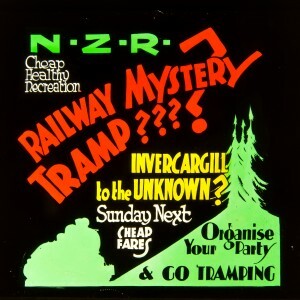 In response to increased competition from the motor car New Zealand Railways established a Publicity Branch and in July 1920 the Railways Advertising Studio was formed. It is likely that they produced the art work for this lantern slide which advertises a Mystery Tramp day excursion. The health benefits of train travel, often overstated in New Zealand Railway’s promotional material for urban rail-services, is merited on this occasion as the day-trip is encouraging participation in an outdoor physical pursuit. In an age when we are bombarded with advertising images through a plethora of digital channels, researching the history of this glass slide has brought me closer to appreciating the lantern’s ‘magic’. New Zealand Music Month has finished yet again! 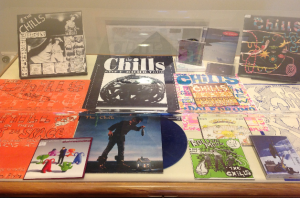 While overall Hocken Collections had a quiet month, music wise, this year we played a significant part in the launch of The Chills new live album Somewhere Beautiful, held on May 31st. The recording is not your typical album release. 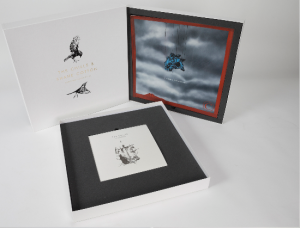 A triple LP set in a double gatefold cover (45rpm speed, on heavy 200gram vinyl); the live album is housed in a 24” portfolio box, with original diptych prints by renowned artist Shane Cotton. 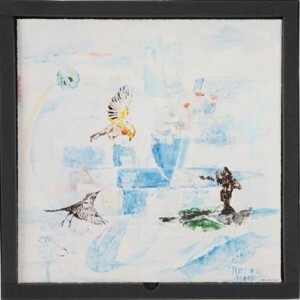 Cotton’s artwork for the package is called Rolling Moon (after The Chills’ song), and the prints are mixed media, with metal foil and additional materials. Each print is unique, with different lyrics from Somewhere Beautiful silk screened onto the images. These will be collectors’ items – only 150 have been produced, and are a wonderful example of how art and music interweave, especially as Martin Phillipps’ (The Chills lead singer, multi-instrumentalist and songwriter) lyrics’ are vivid with imagery, and ripe for interpretation. The launch for Somewhere Beautiful was a gathering to celebrate both the work of Martin Phillipps and The Chills, and Shane Cotton, and this extraordinary collaboration. All were in attendance (including Chills members Erica Stichbury, Oli Wilson, James Dickson, and Todd Knudson), and both Phillipps and Cotton spoke about the work. 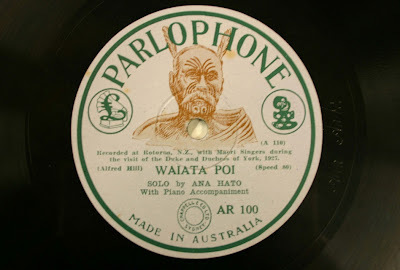 Phillipps also played a solo four song set where he performed ‘Pink Frost’, ‘Male Monster From the Id’, ‘House with A Hundred Rooms’, and new song ‘Molten Gold’ to an appreciative crowd. Hocken Librarian Sharon Dell and I also collaborated with Phillipps and his manager Scott Muir to produce a postcard to commemorate the event, using an iconic piece from Phillipps’ collection. 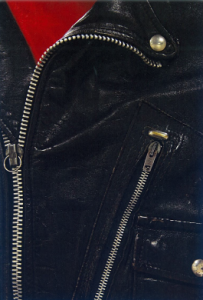 We were lucky to be able to use the leather jacket, immortalised in The Chills’ song ‘I Love My Leather Jacket’ for the postcard image. We felt very fortunate to be included in such a wonderful event! On 23 December 1953 Queen Elizabeth II and the Duke of Edinburgh arrived in New Zealand for a royal tour. 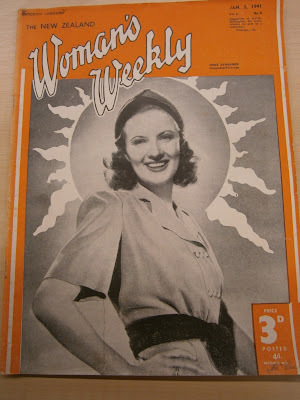 It was a big deal for the country, and it’s been estimated that three quarters of New Zealanders saw the young Queen. A new addition to the Hocken Collections is a memento of that time of optimism. Legend Land of Mysteries, written by Florence Wynn-Williams was a Christmas gift presented by the author to the Queen for Princess Anne. We have acquired the author’s copy, one of only six published, and it is the only copy whose binding matches that of the presentation copy. 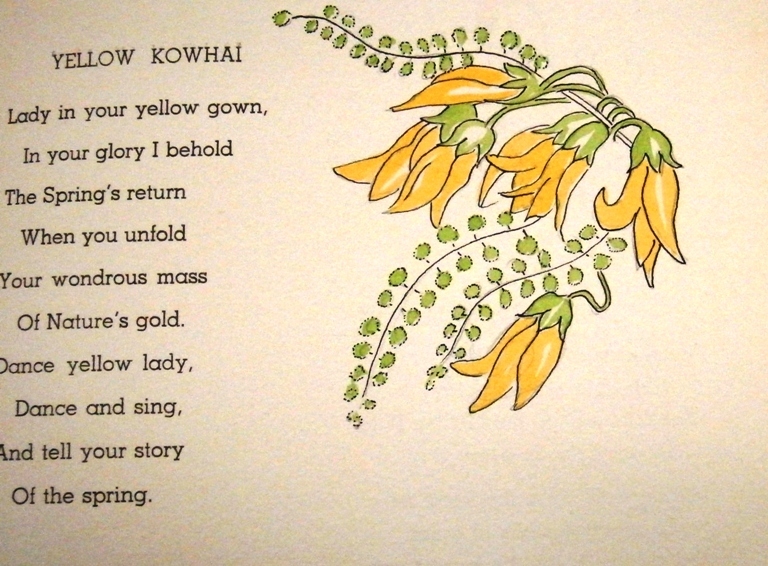 Consisting of children’s poems with hand-drawn and coloured illustrations, it is a delightful work with a distinctly New Zealand flavour. 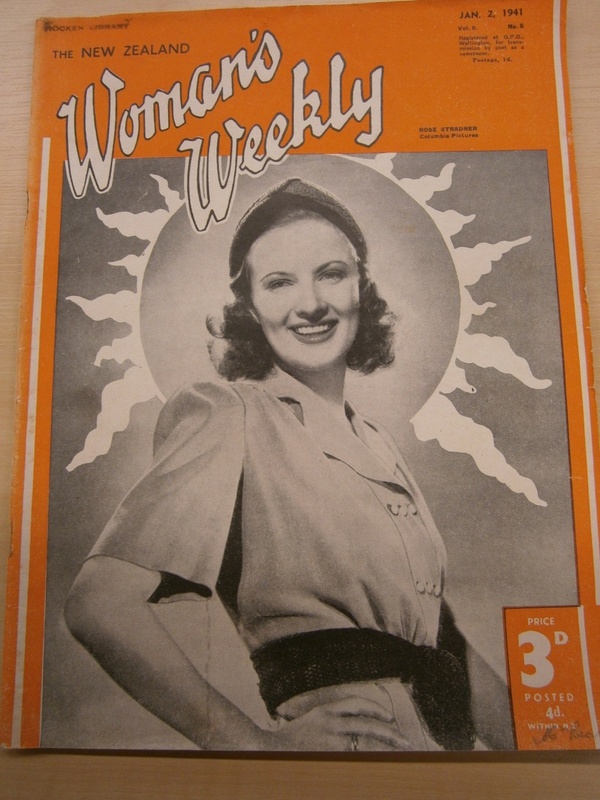 New Zealand’s longest running women’s magazine is turning 80 this year. 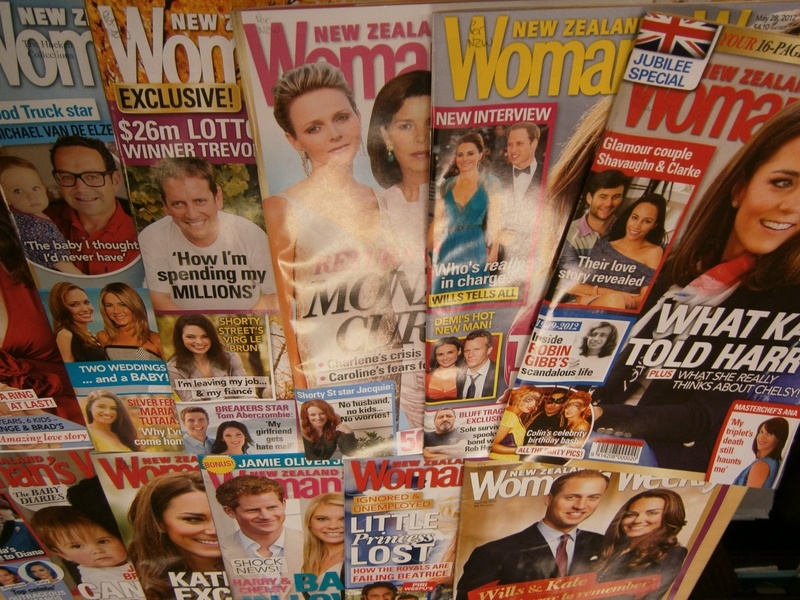 The New Zealand Woman’s Weekly has been celebrating recently after more than 4000 issues. The magazine has remained popular over its 80 year history and it is the most highly used periodical title in the Hocken. 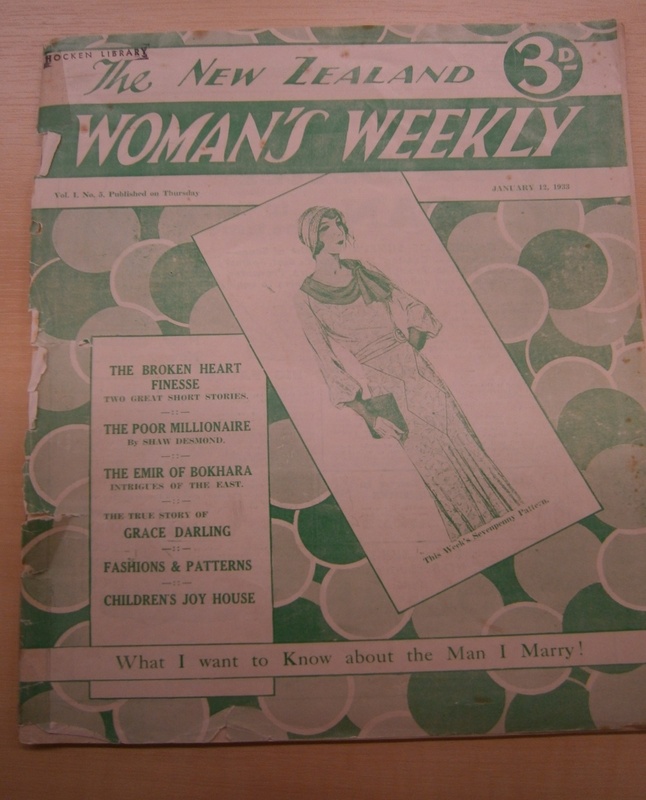 Students and researchers have been using the New Zealand Woman’s Weekly for all sorts of research, and one of the most recent examples of this was Frances Walsh’s book, “Inside stories: a history of the New Zealand housewife“. While the Hocken has a good collection of the New Zealand Woman’s Weekly, including some microfilm, it is far from complete. From the 1930s to the late 1960s we have many gaps. We would love to receive any New Zealand Woman’s Weekly issues that people don’t want anymore and we need. We rely mostly on public generosity for these older issues. Please email or call us if you think you might have something, we would love to hear from you. It’s New Zealand Music Month, and a good time to (re)introduce the Hocken recorded music collection! 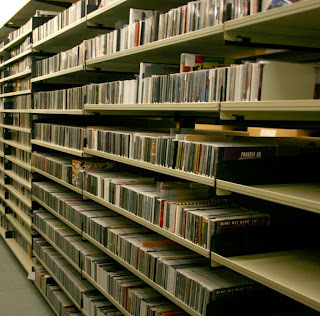 We currently have over 16,000 items in various formats (vinyl, CD, 78rpm discs and cassettes), and are increasing our collection holdings constantly. We collect all genres of New Zealand music (with special emphasis on Otago and Southland recordings), and acquire major current releases, as well as all releases and re-releases from the re-born Flying Nun label. Much of Hocken’s music is rare. The earliest recording held is a 78rpm disc of Wellington baritone John Prouse singing ‘The Maid of Morven’, recorded in London in 1905. We hold the first New Zealand recordings – concert performances of Ana Hato and Deane Waretini from 1927. Early Flying Nun releases are also rare (and valuable), as many have never been re-issued, and are viewed enthusiastically by international and local collectors. We are fortunate to hold such an extensive collection of these rarities, and we invite you to come and (re)discover our music. 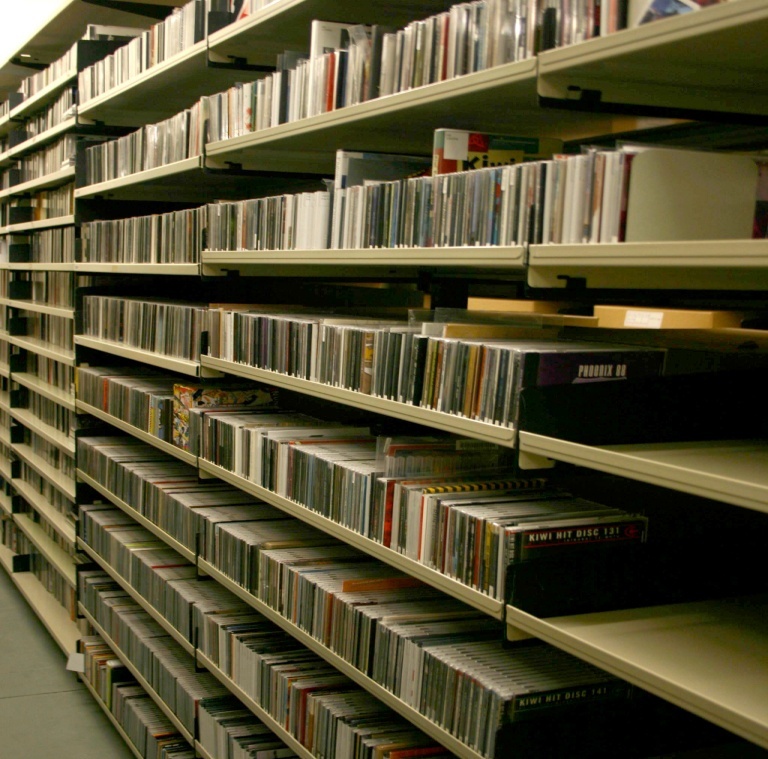 More information on Hocken’s music collections can be found here http://library.otago.ac.nz/hocken/music.html. Archivists who work in “collecting archives” sometimes have a bit of a love/hate relationship with rare book and manuscript auctions. On the one hand they can be a tremendous source of exciting and significant material. On other they may be a drain on scarce funds, and often collections of related material are split into separate lots or even into different auctions in order to make the best profit for the vendor. Frustratingly for the archivist this means you might get some of a collection of papers but not all. Only having part of a collection of course detracts from the usefulness of the collection as a resource for historical research. What’s a “collecting archives”? – an archives institution that collects (by donation/bequest, deposit or purchase) archives from the community and organisations. The Hocken Library is one of the larger collecting archives in NZ as well as being a pre-eminent research library and gallery. The other main kind of archival institution is an “in-house archives” which mainly receives archives as transfers from a parent organisation; a local example would be the Dunedin City Council Archives which receives the archives it cares for directly from the Dunedin City Council. Of course the lay person wanting to find a safe repository for their papers is not usually too concerned with the differences between archives and so it is that sometimes “in-house archives” end up with material that doesn’t really fit their collection scope. Instead of destroying unwanted material that clearly has some historical value, archivists ask around amongst their colleagues as to whether another institution might like to have it. And so it was that a small box of treasure found its way to the Hocken last week from the DCC Archives. What’s this got to do with Winston Churchill? Well, amongst the items in the box was a minute book and copy of a letter relating to something called a Churchill Auction in 1942 in Dunedin. My curiosity was piqued and I started reading. There were four of these auctions held up and down the country in 1942 to raise funds for the Patriotic Councils. The idea was started when Prime Minister Peter Fraser visited Winston Churchill in England. Churchill made a gift of a book written by an earlier Sir Winston Churchill and published in 1675, Lives of all the Kings of this Isle, to be auctioned in NZ to raise patriotic funds. Hearing of this gift the writer Pat Lawlor contacted the Department of Internal Affairs and suggested that they encourage local committees to organise local auctions of donated material to augment the funds raised by the sale of the book. People up and down the country were encouraged to donate their rare books, documents, manuscripts, paintings, prints and Maori and historical “curios” to the cause. Messrs J. H. Bethune and Co. Ltd of Wellington provided their entire mailing list so that the central organising committee could contact book, manuscript and picture collectors (no Privacy Act back then!). The Dunedin Committee discussed the idea of collecting letters of Katherine Mansfield and advertising the auction in North America to encourage a better price! I inwardly groaned, wondering what New Zealand archival treasure had been hocked off overseas! Luckily the impracticality of the suggestion precluded advertising overseas and I cannot find any mention of Katherine Mansfield letters being offered for sale. As it turns out the auctions raised some money but not as much as was expected as the market for such items in NZ was not great. In Dunedin over five hundred pounds were raised a newspaper report noted that demand and prices for NZ books in the auction was good but poor for overseas material such as first editions of Dickens. And to my relief it seems that no archives or manuscripts were sold overseas. 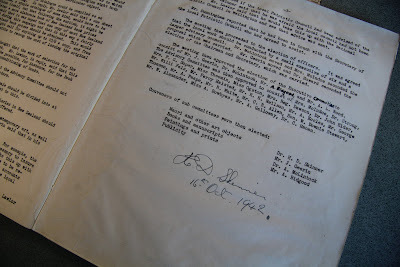 Thank you to the Dunedin City Council Archivists, Allison and Chris, for sending this material to the Hocken.